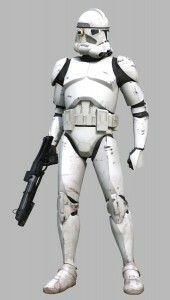 The clone troopers of the Grand Army of the Republic are soldiers in the Star Wars universe, cloned from Jango Fett, a Mandalorian bounty hunter. They first appeared in Star Wars Episode II: Attack of the Clones, and returned in Star Wars Episode III: Revenge of the Sith where they were played primarily by Temuera Morrison. In the two Clone Wars animated TV shows, they are voiced by Andre Sogliuzzo and Dee Bradley Baker. Clone troopers comprised the bulk of the Army of the Republic during the Clone Wars. They are depicted as the main part of the armed forces of the Galactic Republic in its final years, becoming one of the largest armies ever assembled, only surpassed by the Separatist Droid Army. Nearing the end of the clone wars, they were ordered to slay the Jedi. This famous Jedi purge was known as ‘Order 66’. After the Clone Wars, they served as the nucleus for the armed forces of the Galactic Empire, eventually becoming the Imperial Stormtroopers. One or two piece black undersuit. Commonly used components include sports comression wear, warm-up suits, dance unitards, or diveskins. Undersuit must be smooth in appearance or with vertical ribbing with no labels or logos visible once the armor is on. Episode III (Phase II) style Clone Helmet – Fanmade helmet. Some “name brand” helmets may be unacceptable. Helmet frown is charcoal grey in color. Wire or plastic mesh is utilized inside the helmet to cover the open pieces of the frown. Grey stripe around back of dome. Chest – Two detail slots on right breast. Chest and back plate should match together at the sides with no gap, just a seam line. Shoulder Straps – Correct shape with ridges. Upper Arms – Front/back pieces are seamless. Forearms – Front/back pieces are seamless. Elbows – Two detail slots on the outside area of both elbow pieces. AB plate – Four 1/4″ diameter holes per side on indents of ab plate, eight holes total. Upper thighs – Front/back pieces are seamless. Knees – Detail clip with slots on each side of both knees. Knee Straps – Correct shape with center portion of both knee straps raised and primer grey. Lower Legs – Front/back pieces are seamless on outside seam as minimum requirement. Note: – All armor should be matte white or satin white (NO GLOSS). – Armor does not have to be weathered. If weathering is preferred, black wash is an example of an acceptable weathering technique. – No obvious, visible rivets. White, ankle high or tall enough to cover the ankle and eliminate any black undersuit visible at the ankle area in armor. Boots must be lace-less and have flat soles. The boots have armor detail to include a natural seam at the toe and a strap that goes over the top of the foot with two protruding disks at each side of the strap. There should be no markings or labels from the shoe makers.